In Opalescent maroon with Beige hide interior, the original colours. We're very lucky to have two Mk10 Jaguars, a lovely 4.2 and this outstanding 3.8. 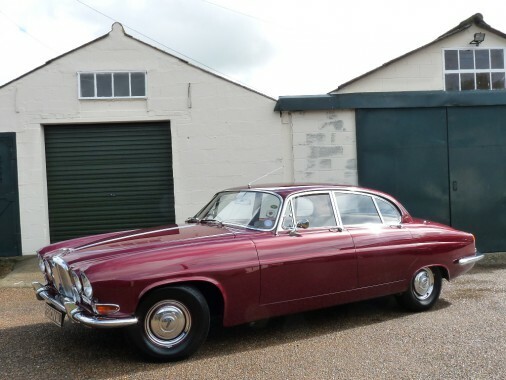 In beautiful condition throughout, this early Mk10 Jaguar has only covered 49,000 since new. It features a triple carburettor, 3.8 six cylinder engine with a three speed automatic gearbox, power steering, ACE rim embellishers, and its original radio. It is fitted with lambswool overlay rugs, a rare 'Henlys' front centre armrest/glovebox and front seat belts. The car had one owner until 2009 when it was thoroughly re-commissioned and repainted to cure fading paintwork. The history file shows that the last fastidious owner of six years has spent in excess of £12,000 maintaining and improving this stunning Jaguar, and he has been an enthusiastic member of the JDC and JEC, showing the car on many occasions. One of the best Mk10 Jaguars around.